Come into any of our Goodwill retail stores and find name brand discount clothing and accessories at bargain prices. Our stores receive thousands of new clothing items everyday so our inventory stays fresh. You never know if your going to find, a brand new pair of $80 jeans for $3.99 or some heels that perfectly match your outfit. Join our email list for monthly updates on discounts, sales, and promotions. We have an amazing selection of women’s clothing; dresses, skirts, blouses, fitness wear, jeans, handbags, shoes accessories and more. For men, we have slacks, jeans, button ups, long-sleeve and short, shorts, shoes, belts, ties and the list goes on. While your in our store we have housewares, furniture, electronics, decor and everything else you can think up. Discount clothing has never been so fashionable. If you are looking for a higher end brand name items or designer bags and shoes, check out our GoodThreads Boutique on Oracle just north of Ina. A trip to a Goodwill Thrift Store not only helps your bank account, it helps your community. Your thrift store finds help fund our 5 local youth programs and 5 local adult programs, in the last 5 years we have served over 50,000 individuals right here in Southern Arizona. 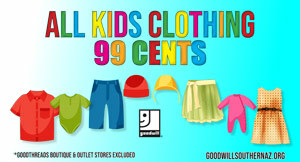 Kids clothing at all of our Goodwill Retail Thrift Stores have been permanently marked down to 99 cents an item. Outlet Store locations and the GoodThreads Boutique are excluded. We know raising a family can be expensive, from rent, to bills, sports leagues and clothes. 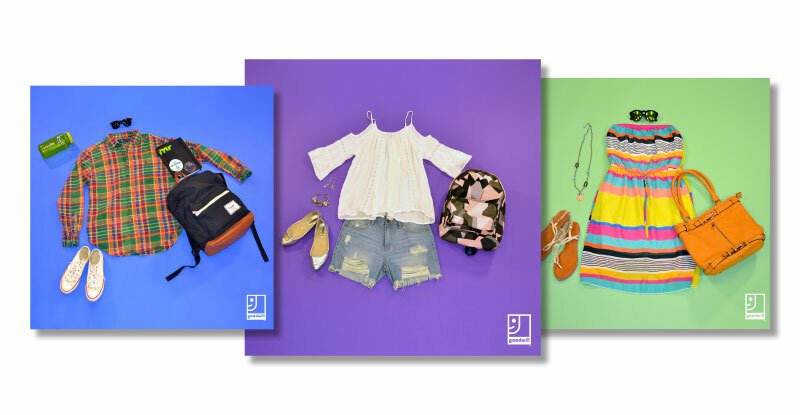 Goodwill is committed to making children’s clothing affordable for our most price sensitive customers. You can come find name brand, like new clothing at a fraction of the cost.